Joseph Saxton Gallery of Photography: "Eight, Twentieth-Century Master Photographers"
Although it's difficult to imagine today, in our image-saturated culture, there was a time when photography was viewed as merely an instrument to help other forms of art emerge. Basically, photographs were thought to have no intrinsic value themselves, let alone, as a form of art. Today, this is incomprehensible. Even those with little or no interest in art or photography, are familiar with Steve McCurry's "Afghan Girl," Bob Jackson's "Assassination of Lee Harvey Oswald," or Eddie Adams' "Saigon Execution". Such was the case with Eugene Atget. His photographs were produced to aid artists in creating their paintings of French monuments and landscapes. The photographs were essentially documentary in nature, so that painters had a template to create their art. Although his work is highly recognizable in contemporary society, he adamantly referred to himself as an "author-producer". 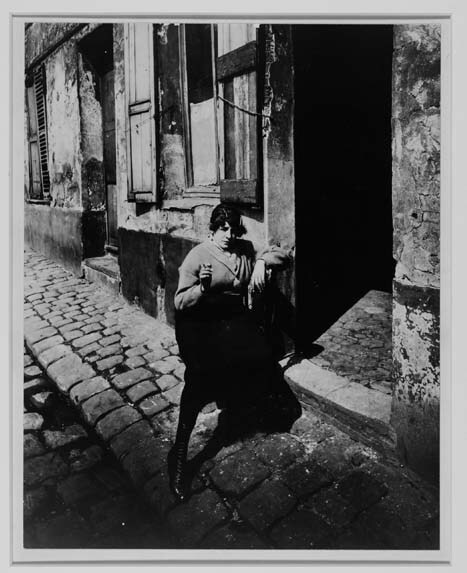 Just as the artists in this show influenced today's artists, Eugune Atget was the inspiration for his peers and the generation who followed him, including Berenice Abbott and Edward Weston. If it were not for Berenice Abbott, the work of Eugene Atget would not have been recognized and cherished, or even available. Because his photography wasn't considered significant during his lifetime, we would not have had access to it today. Due to Abbott's recognition of his talent and because she rescued over 1,500 glass plate negatives and 8,000 photographs, we are privileged to enjoy his photography. Berenice Abbott shared Eugene Atget's view on photography. Her interpretation was that it should have legs of its own and be presented unembellished. Much like Atget and his beloved city of Paris, Abbot was passionate about photographing New York city before "...these exciting and important momentos of 18th and 19th century New York (are) swept away to make room for new colossi". 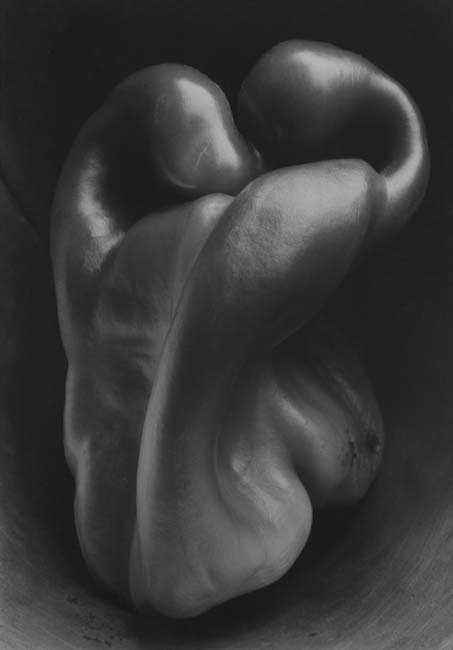 Much like Atget and Abbott, Edward Weston took a rather colorful journey before finding his niche in photograpy. He began his photographic career as an itinerant photographer taking photos of children, pets and funerals. He moved on to become a photographic retoucher and then a portrait photographer, employing a soft-focus, pictorial style. The turning point for Weston was in 1922, when he forsook his former style, instead incorporating a more straightforward approach, with sharper detail. In his own words, he stated, "The camera should be used for a recording of life, for rendering the very substance and quintessence of the thing itself, whether it be polished steel or palpitating flesh." 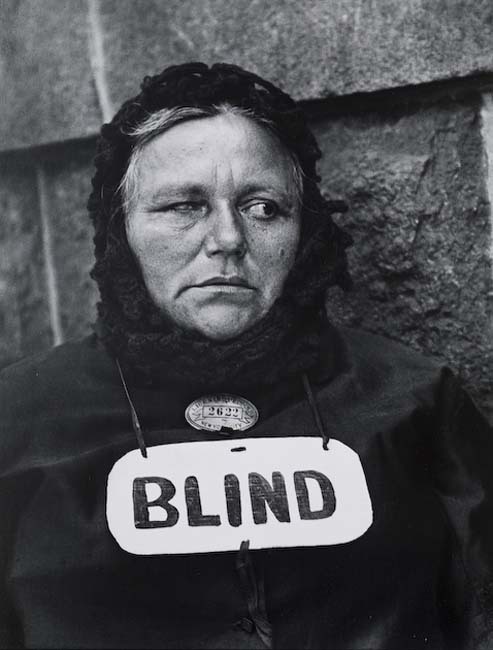 During this same time, Weston met Alfred Stieglitz and Paul Strand, among others. Stieglitz gained fortune through his endeavor in the clothing industry and then sold the business ten years later, to commence European travel and dedicate himself to art admiration. After traveling about Europe for a number of years, he returned to the U.S., determined to make photography an artistically excepted medium, in the same vein as paintings or graphic arts. In 1903, Alfred Stieglitz became associated with Edward Steichen. Steichen, like many other artists, started as a painter, having attended the Académie Julian, but abandoned his studies and eventually made his way into the photographic world. There he gained a reputation as a noteworthy portrait photographer. After several years, he found this work to be dull, albeit profitable. Hence, he was determined to return to his roots, as a painter. While on this journey, he stumbled onto other paths, thereby rejuvenating his photographic passion. He was introduced to the Autochrome, a technique that created a color, glass-plate transparency. Meanwhile, Steichen made his "...first attempt at serious documentary reportage," lending itself to a freedom in photography, which had never before been known. This newer style had even more popularity than his former, appealing to a much larger audience, who appreciated this modern, editorial, commercial-style. Because of the transition, Steichen has left a rather bipolar legacy as not only a photographer with a painterly quality, but also the more contemporary artist, who produced cutting-edge celebrity photos, as well as fashion and glamour ads. Paul Strand, born in 1890, started studying with Lewis Wickes Hine (who brought to light to the horrifically inhumane labor practices commonly employed during those days, especially involving children) as a teenager. By Hine's suggestion, Strand began to visit "291," the studio which was originally rented by Edward Steichen, and later came to be the Little Galleries of the Photo-Secession, run by Alfred Stieglitz. Through exposure to the work of Pablo Picasso, Paul Cézanne and Georges Braque, by way of the 291 Gallery, Paul Strand, formulated a photographic style that essentially broke down objects so significantly that they appeared more like abstract forms and patterns, than the objects themselves. Strand had no interest in the former painterly-style photographs. He embraced the objectivity of the medium and with it, its limitations. In its application to people, it had a direct, almost confrontational appeal, like portraiture meets street photography. This honest style would influence a string of other great American photographers. Henri Cartier-Bresson, also influenced by the cubist, Georges Braque, was born in 1908, near Paris, in Chanteloup, a rural village. Coming from an affluent family, who accrued wealth from manufacturing thread, he was expected to eventually manage the family business, but art was in his blood, quite literally. Like his great grandfather and uncle, Cartier-Bresson chose to instead pursue his passion. Rather than mathematics, he loved banned literature and visual arts, creative studies. 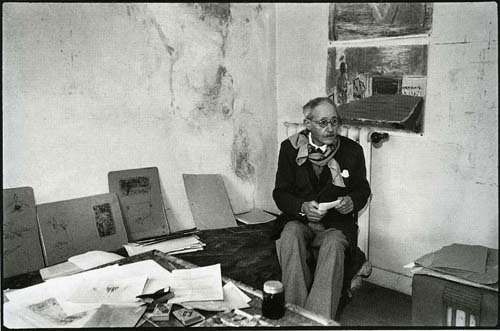 Fascinated by trips to his uncle's painting studio, Cartier-Bresson took up art, as a preteen. While studying under Jacques-Emile Blanche, Cartier-Bresson became very interested in Surrealism (an art style which is expressed in a rather dream-like fashion, juxtaposing common objects in an odd or illogical manner). He even studied Cubism under André Lhote, a French Cubist. After a compulsory year in the military, Cartier-Bresson discovered photography through a Brownie camera, and eventually became disinterested in his former passion of painting. Although it would take about three years, he eventually committed himself to the craft of photography, utilizing the infamous Leica camera. Cartier-Bresson had little interest in the technical aspect of photography, but respected it only from the perspective that it allowed him to document what he saw, giving instant results. It is perhaps why he had become disenchanted with painting. 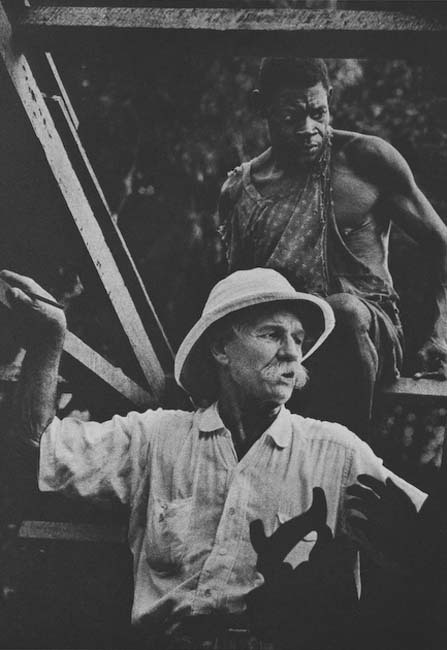 Through the years, he made association with other influential artists such as Paul Strand (film-making) and Robert Capa (photojournalism and with whom he founded Magnum Photography, along with David Seymour). With all of these experiences and more, Cartier-Bresson is known as the revolutionary who captured the "decisive moment" even though he was quoted as saying that "Not only am I an amateur; even worse I am a dilettante". As history reveals, far be it the case. William Eugene Smith born in 1918, in Wichita, Kansas, started his career working for the local news, as a young teenager. His calling as a documentarian resulted in him becoming one of the single most, if not most, significant American documentary photographer, with regard to the photo essay. He had what some would call an obsession for recording his world and it wasn't just through photographs. Towards the end of the 1950's Smith abandoned his first wife and two children to fully lead the life of an artist. In addition to photographs, Smith also made audiotapes of musicians playing their jazz, as well as the conversations that artists had with one other. His loft became a meeting place for photographers such as Cartier-Bresson, Robert Frank and Diane Arbus, jazz musicians including Sony Clark, Chick Corea and Thelonious Monk, as well as a host of other well-known individuals, including Salvador Dali and Norman Mailer. Smith himself said (although it was in the context of war) that “... I wanted my pictures to carry some message against the greed, the stupidity and the intolerances..."
Because of their dedication, conviction, craft and attitude, these great men and women honorably carry the title of Master Photographer.